This project teaches you to make a darling straw and silk bonnet. The brim is covered with our tiny straw substitute and the back crown is lovely aqua silk. 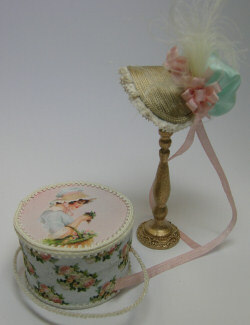 Ribbon loops and feathers adorn the bonnet and there is a matching hatbox included.